It was fast. 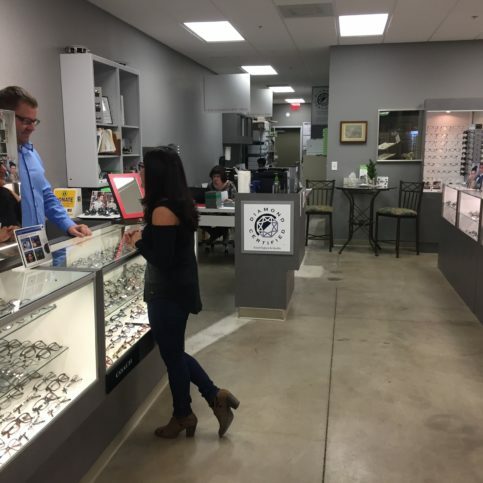 I had gone to Lens Crafters for years, and they couldn't give me the appointment I wanted, and their routine care took about 3 hours, which I thought was normal. Then I ran around to Site for Sore Eyes, and they fit me in within the next day to see the doctor, and I was in and out in about an hour and half. It was great and now I only want to go to them. They did their best to accommodate me. They ordered the ones I wanted and let me try them on before I made a purchase. I got great customer service. All my questions were answered and I was very happy with the service. The people out front really helped me out since it was my first time getting glasses. Site for Sore Eyes - Napa provides a wide range of eyecare services. 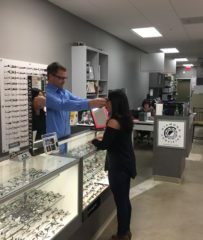 In addition to offering an extensive selection of the latest in designer eyewear, goggles, and sunglasses to fit every style and budget, Dr. Gareth Valles checks the health of customers’ eyes, determines corrections (if needed), and provides prescriptions for eyeglasses and contact lenses as needed. 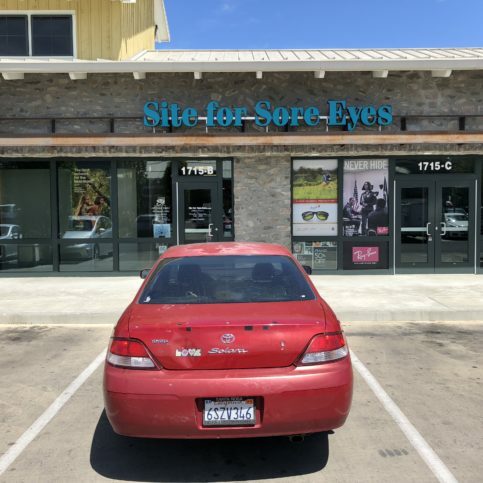 Site for Sore Eyes’ technicians man an onsite lab where they attend to eyewear issues and repairs, and they can provide same-day service in most situations. The company honors and bills most vision plans, and all major credit cards are accepted, as well as CareCredit. A Site For Sore Eyes employee helps a customer try on a pair of eyeglasses. 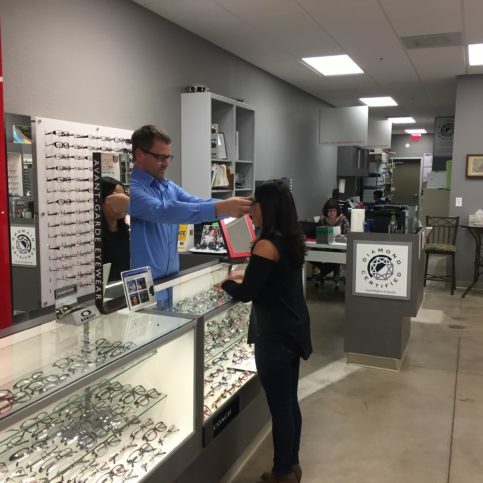 Site For Sore Eyes – Napa aims to provide quality eyewear, fast and courteous service, and value for its Napa and Sonoma County customers. 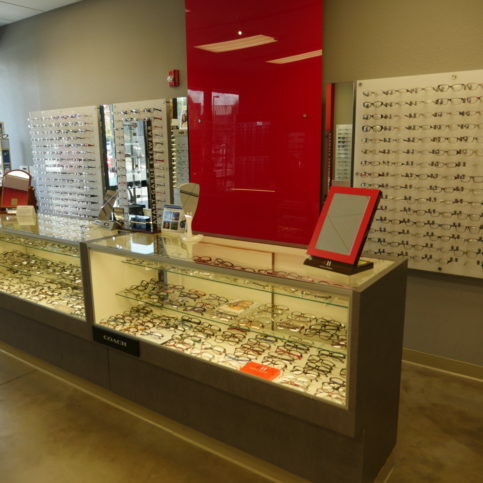 “We have an eclectic, broad selection of eyeglasses, contact lenses and accessories,” says owner Nick Saab, “and we feature designer and non-designer eyewear brands.” The company’s onsite lab can provide same-day service for most work, and an onsite optometrist is available seven days a week through Sterling VisionCare. 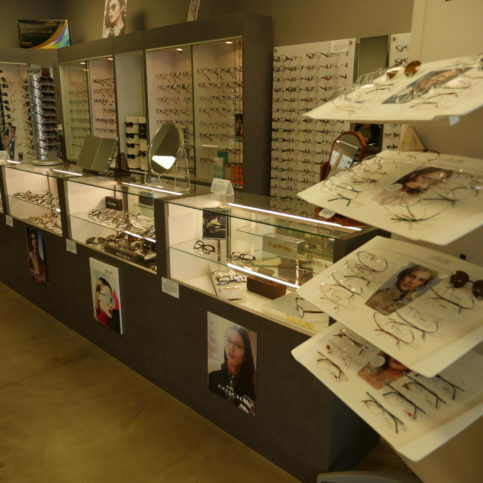 If a customer already has a prescription, Site For Sore Eyes’ opticians can fit, sell and adjust new eyewear from its existing stock. When preferred, custom orders can be made onsite or by telephone, and most orders can be completed within one week or less. The company also offers standard and specialized lenses. Select an eyewear and vision examination provider based on your individual needs. A vision examination is one part of basic vision care; selecting corrective eyewear, such as glasses and contact lenses, is another. Choosing an eye care professional should solely depend on the needs of the patient, but it’s often driven by ease of insurance billing and claims administration. When looking for a vision care company, make sure the people helping you are well informed. Experience and knowledge are critical to selecting safe and comfortable eyewear or contact lenses. Several major retail chains have rigorous training requirements for opticians and affiliated optometrists. Ophthalmologists are medical doctors concerned with the anatomy, physiology and diseases of the eye, while optometrists are health care providers trained to address vision problems and care. The latter are allowed to recommend additional care and vision correction—most people think of optometrists when they go for an eye examination. 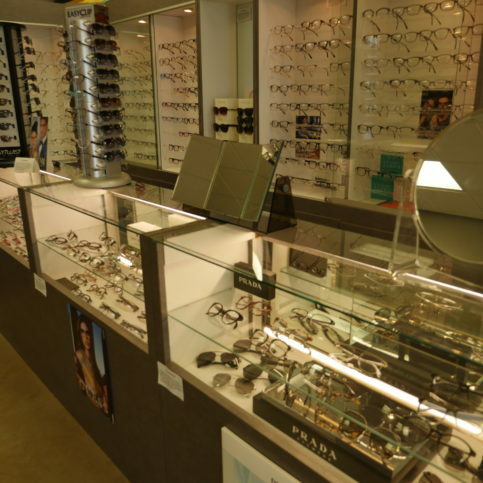 In many cases, optometrists also sell corrective eyewear and contact lenses. Opticians are generally sales professionals trained to design, select, fit and disperse corrective eyewear. 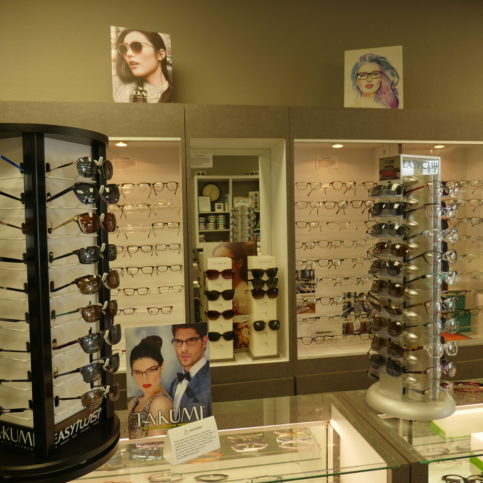 Most optometric offices and major retail eyewear stores staff opticians as well. Look for a professional eyewear dispenser that’s both knowledgeable about the industry and versed in its technological advancements. Also consider the level of ongoing customer service it offers after a purchase and its selection of popular, boutique or innovative brands. Q: Do you accept vision insurance? Q: How fast can I get glasses? Q: Do you have an eye doctor available for examinations? Q: Do you offer all types of lenses? Q: Can you grind lenses? The staff of Site for Sore Eyes – Napa are fully trained to help clients select frames which suit their facial features, style and budget. Modern lenses also address another symptom of screen time: overexposure to blue light, a spectrum of light emitted by digital devices that further contributes to eye fatigue. Lens manufacturers now offer coatings designed to eliminate this blue light spectrum from the wearer’s vision. So, if an outdated pair of glasses is inhibiting your comfort and productivity, consider upgrading your lenses. These visits are especially important for children and young people with a family history of vision problems. Likewise, many individuals start to experience eye strain in middle age as their professional demands require more time at the computer. As soon as you experience eye strain symptoms like blurry vision or excessive squinting, you should make an appointment with an eye doctor. By visiting your eye care professional regularly, you can address these problems before your symptoms start impacting your daily life. Dr. Edward Loui: We’re living in a world where we are increasingly using digital devices and looking at our tablets and phones and computers. And that puts an extra strain on our vision and our visual system, which causes eye strain and eye fatigue. And the old conventional lenses that we’ve had, the manufacturing of these lenses inherently causes what are called aberration or higher-order aberration in the lenses, which creates some distortion, and especially out in the periphery, and some glare, which would actually cause more eye strain. Now, modern lenses these days, which are mostly called high-definition lenses are made in the lab in more precise form, and they can manufacture these lenses more precisely to eliminate most of these aberrations. And as a result, the vision will be clearer, sharper image, less aberration, less glare, better peripheral vision, better — higher contrast sensitivity, which is important to see things clearly. So, the other thing that we’re finding out is that there’s a spectrum of light called blue light that we found that causes eye strain and eye fatigue. And blue light is emitted by your digital devices. And there are coatings nowadays that are designed to eliminate the blue light spectrum. And as a result, again, you would have clear vision, less glare and less eye strain when you’re using your digital-computer devices. 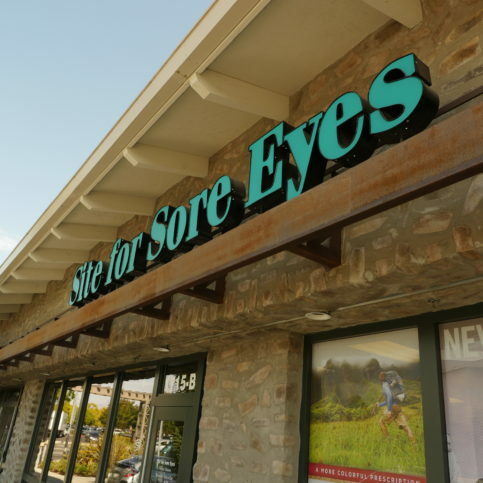 Site for Sore Eyes – Napa : Average 8.5 out of 10 based on 770 unique customer surveys of customer satisfaction. She was very nice and helpful. Go get your glasses there. The guy was super helpful. We are always happy and get good quality service. The lady that helped us was really good with my daughter. She helped her feel confident in picking out her glasses. I liked their customer service, and the doctor was great. She was really good at explaining things, and the whole process felt easy, not complicated. She answered all of my questions. I just loved her. Their excellent customer service through their work, they listen to you and don't look at you like you are just another patient. The doctor provided exceptional customer service, follow through, and even gave me a recommendation that corrected my issue after I had been to 3 places prior that just brushed me off. Customer service, the doctor was very genuine and gave me a referral. She also sent an email, which she didn't have to do, and then, she even followed up with me. I like the glasses and customer service. Customer service, I really liked the guy who helped me. I can't think of his name right now. 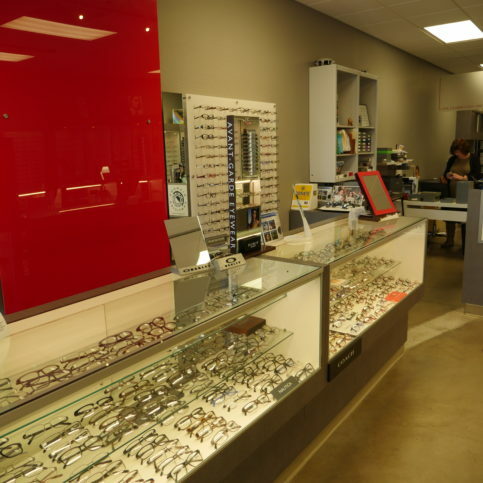 It's a pretty decent place if you need contacts or glasses. The Optometrist was very friendly and nice. They have a very good designer selection of frames, and they work well with insurance compaies. I personally worked with Sias, and he gave us a great deal. They show they care about their customers, our satisfaction and needs. I like all the options that they have. I am a bigger person and went to a lot of stores, but I couldn't find glasses that fit me except at Site for Sore Eyes. They have a good variety to choose from. The service, everyone was very nice. If people are looking for glasses or eye appointments I always recommend them. The doctor is good and an independent owner. The service was really good and fast. I got my glasses in 3 days. The doctor is good and very detailed. The doctor was really good. They have a good product, and their people were very helpful. Whenever you ask things, they will answer you. They were cooperative and helpful. The product they offered worked well for me, and they were able to work things out that I needed.